Tate and Spencer with their children at the YWCA. 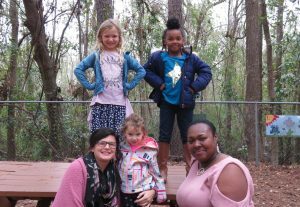 But what really makes the difference is that for the 75 employees of the YWCA Lower Cape Fear, the cost of child care is subsidized. For a working parent with two children in child care, this can amount to more than $7,000 in savings annually. The YWCA advances their mission to eliminate racism, empower women, and promote peace, justice, freedom, and dignity for all through a remarkable array of programs, outreach, and events. For families in the community, the YWCA can be a life saver—a go-to for affordable, quality child care from infancy through adolescence—offering full day care, half day, afterschool, and summer care—and parenting support for teens through grandparents. The YWCA decided to develop a policy that encourages employees to take advantage of the programming they have in place for the community. Full-time employees receive a 50 percent discount off of youth programs and child care services, and part-time employees receive a 20 percent discount. Today, almost 40 percent of employees take advantage of this benefit. Pamella Spencer, program coordinator, has three children, two of whom are involved with the YWCA’s child care programs. Her 5-year-old daughter attends and her older son, who attended when he was younger, chose to return to the YWCA to fulfill his volunteer requirements as a freshman at Isaac Bear Early College. For Spencer, the program is ideal: payment for child care comes out of her paycheck as a deduction each month, and her daughter is cared for by her coworkers. Tate and Spencer both agree that they have much stronger relationships with their colleagues as a result of having their children in child care at their workplace. They also understand that having child care on-site is not feasible for all employers. However, what they do suggest is that employers could partner with a child care provider and offer subsidies for tuition, registration or activity fees. The YWCA has the oldest retirement plan for women in the United States. Full-time and part-time employees are eligible.